Lots of people think sourdough bread has extra special health benefits — the fermentation changes the grains and makes them more easily digested. I started keeping some that I wild caught sometime in 2007, I think? It’s hard to remember actually, but that photo was from 2008, when it was going strong. 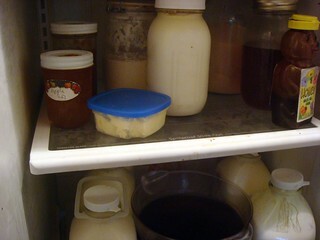 I just keep it in a mason jar with cheese cloth over the top in the icebox and try to remember to feed it once a week. To me, it’s just another critter needing food and water, just less often than all of the other critters in my care. Once, when I was in the hospital for ten days after being rammed by a ram, the first thing I did when I got home was feed my starter. Frank found that odd. I found it odd he hadn’t remembered to feed it while I was gone! It’s pretty easy to keep alive. 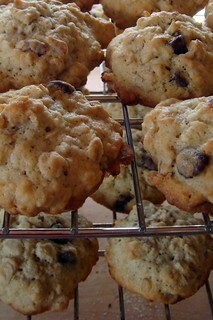 Once a week (or more, depending on what I’m baking), I remove about a cup into a separate container, which I will use. Theoretically, you could discard, but that rubs me wrong, so I always use. Then you add flour and water to the original container, stir it, leave it at room temperature until it becomes bubbly, stir again, and put back into the icebox for another week. But once a week, I have some that I should use, so I’m always thinking about how I’m going to use it this week. If I don’t want something with a too strong sour flavor, I use it immediately while it is still cold, in something like this carrot cake. You can’t particularly taste it that way, but it changes the texture in a really nice way and you can tell something is different. 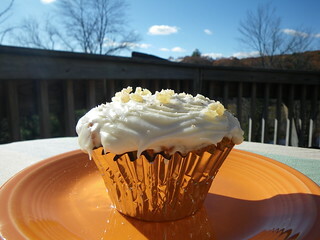 It’s not your typical carrot cake, it’s much, much better. 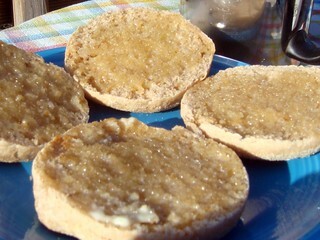 I also like to make English muffins. I’ve gotten pretty good at them, and as my starter ages, they are getting more and more “holey” and chewy, with that special texture they are supposed to have. I really like them and they are fast and easy to make. The dough that’s left over after I cut them all out doesn’t roll well for a second time, but if I gather up the scraps and smoosh them into a log, it makes a pretty neatly textured loaf of bread that I’ve come to enjoy. Sourdough pancakes, sourdough chocolate cake, sourdough pizza crust, sourdough oatmeal chocolate chip cookies … some of them sounded weird to me when I first started looking for ways to use up that cup every week but now they are normal and I really like the difference in texture and flavor. It’s just become normal to use it either as a replacement for regular yeast or in addition to. But what I use it for most often is just as part of our regular bread. 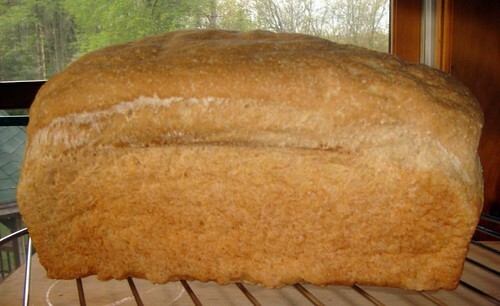 I have what I call our daily bread, made from whole wheat, sourdough, maple syrup, eggs, and lard — nutrient dense. I start it in the bread maker, then punch it down and let it rise overnight in the icebox, then let it rise at room temp the next day, then bake. It’s soft and lovely and full of nutrition, and we just really like it. I add different types of grains depending on my mood, but there’s something about the lard and the sourdough that makes the texture soft and lovely, which is what we like for sandwich bread. I love this! I have never had a sourdough starter. And I want one.